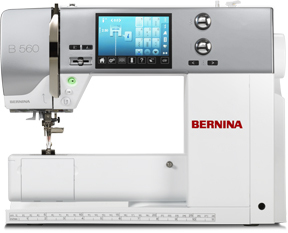 Thursday March 12 through Monday, March 16 you can save up to $800 on a new BERNINA. If you've been thinking about a new sewing machine this is a great opportunity to get one at a fantastic price. Take $500 off any 5 series model (shown here), $700 off any 7 series model, and $800 off the fabulous 880 sewing/quilting/embroidery machine that boasts fully automatic threading, 12 inches to the right the needle, and so much more. If you've been thinking about a new sewing machine this is a great opportunity to get one at a fantastic price. Also, take 25% off on the Quilter Accessory Kit which includes the BERNINA stitch regulator (BSR), a walking foot, the #37 patchwork (1/4 inch) foot, and a magnifying lens set. Don't forget . . . 0% financing on approved credit! Get the details here (scroll to bottom of page). Since the BERNINA sale runs for only five days we will be OPEN on Sunday, March 15th from 1-5 p.m. Stop by to browse, shop, sew, or check out the machines that are on sale. 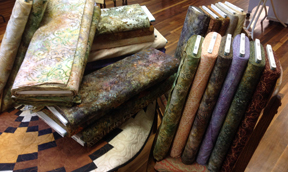 This beautiful collection of batiks arrived on Thursday. We were happy that our shelves were nice and full once we put these up. The very next day all of these came in. Now our shelves are too full. There are worse problems to have! 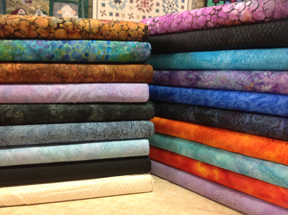 Look for Cortez Quilt Company at Quilting in the Red Rocks 2015 Quilt Show. Karen will be demonstrating the Scrap Crazy ruler both days handing out "buy three yards get one free" coupons to anyone who stops by the booth. Be sure to enter to win door prizes, too! Saturday, March 14, 9 a.m. - 5 p.m.
Sunday, March 15, 10 a.m. - 4 p.m. 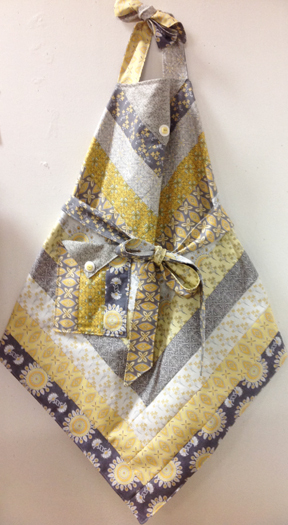 This adorable apron is made using 2 1/2 inch strips. One jelly roll will make two aprons . 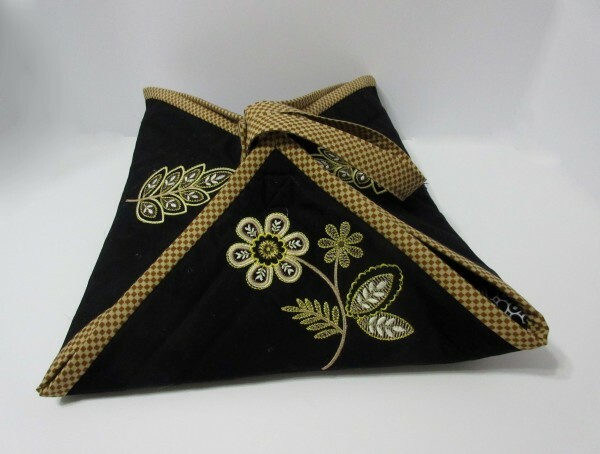 . . make one for yourself and one for a gift. Judy Bryan will teach this class. See the sample hanging at the shop. It really is delicious! 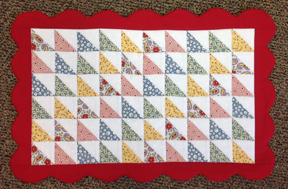 For our March club we’ll make “Scrappy Place Mats.” This pattern shows four variations. 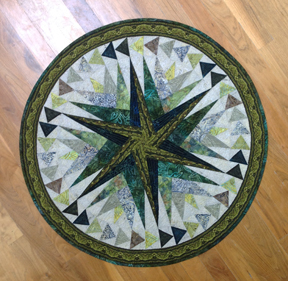 For the sample we chose the one featuring half-square triangles and made it using 30s fabric. 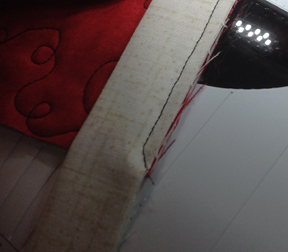 You’ll be amazed by how easy the scalloped border is to make . 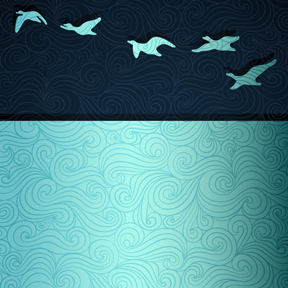 . . no binding! Judy Bryan will be your teacher. While machine sewing on binding when you are almost to the end of one side of your quilt and you stop 1/4" from the end, instead of doing a back-stitch before removing your work from the machine to make your mitered corner and start the next side, stop at 1/4" with your needle in the down position, pivot, and sew completely off the project at a 45 degree angle. 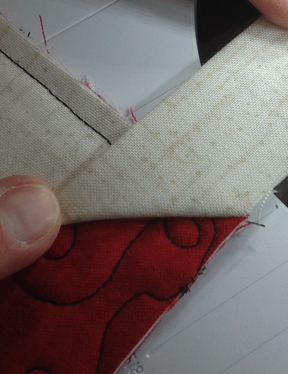 This way when you fold your binding fabric to create the mitered corner your fabric lays nice and flat up against that short 45 degree seam.